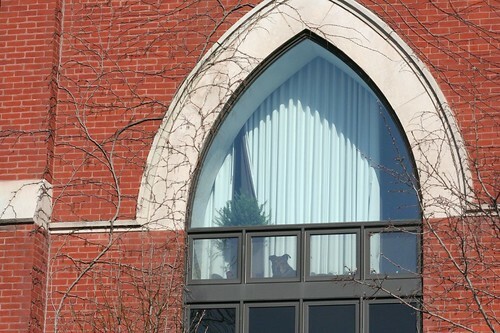 What happens to a church when the congregation moves on? There are four basic answers: demolition, abandonment (which often leads to demolition), reuse (by a new congregation), or adaptation. Adaptation is rare. Church sanctuaries are specially suited to their particular purposes: the frequent meeting of a large group of people witnessing a singular recurring event. Functionally speaking, the only similar purposes in modern society are movies and plays, and the world only needs so many playhouses. Most adaptations require some radical alterations to the space. Nobody likes to see the grand space of a church sanctuary obliterated, but if the alternative is the complete loss of the building, it seems like a palatable trade-off. And, surprisingly enough, it is a compromise that’s been made quite a few times in Chicago. 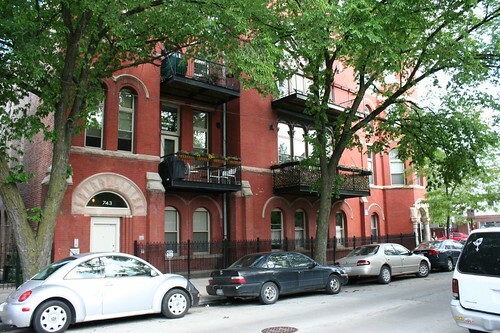 3516 N. Sheffield, in Wrigleyville, is one of the more extreme examples. 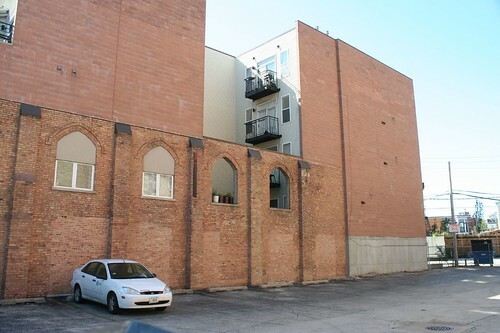 Here, almost the entire existing building was hacked away, leaving only the front facade and a low portion of the side walls. Out of this fragment grows an entirely new condominium-style building. Even the front window was removed, covered up with a new bay window projection. This was originally the Lake View Swedish Church (later the Lake View Evangelical Free Church), a congregation begun in 1887. Faced with the relocation of its members to the suburbs, the church moved out in 1954 to a new building at Touhy and Melvina in the northwest suburbs, becoming the Edgebrook Evangelical Free Church. 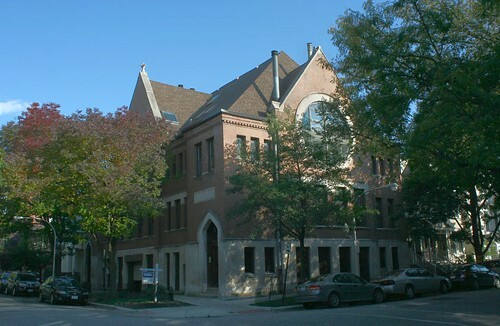 The old building on Sheffield was occupied by the Church of Christ, Presbyterian, a Japanese congregation formed during World War II to serve relocated Japanese residents; it held services in both English and Japanese to meet the needs of first and second generation Japanese-Americans. 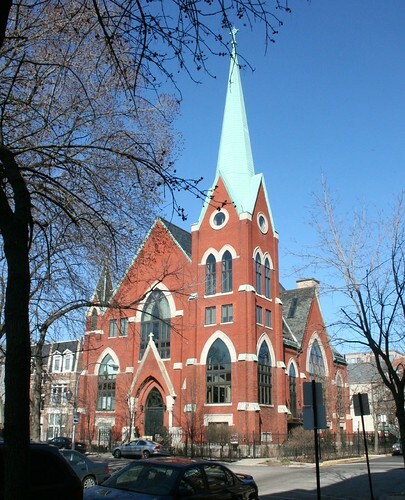 This congregation in 1998 moved out west to the Albany Park neighborhood, near Kimball & Peterson; the old building was converted to residential use by a developer who hoped that preserving the old structure to some extent would give him a better shot at a zoning variance. 1 The most ingenious use of the old structure is here, where a former sanctuary window opening now admits light and air to an enclosed porch. 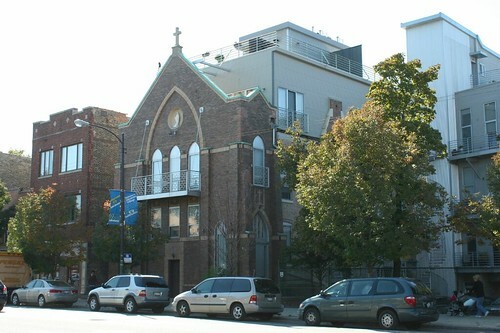 A similarly radical reconstruction happened to 916 N. Western Avenue, an 1888 church building previously home to Our Lady of Good Counsel Catholic Church, a Bohemian and Slovak church that closed in 1989 due to a dwindling congregation and rising debts.2 3 The conversion removed the roof and interior, and includes new balconies on the front facade. But not all church conversions are so destructive. This 1893 church at 2558 W. Cortez retains its original form and still has the sanctuary space largely intact4 Of course, it’s easier to keep such a space intact when it’s being changed to a single family home. This was originally the Evangelical Bethany Lutheran Church, built in 1893 in what is now Ukraine Village. 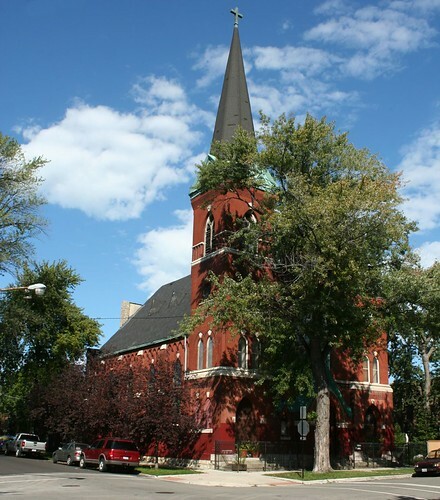 Around 1925 the congregation relocated west (to a building that still stands at Wabansia and Narragansett, near Oak Park); the Good Shepherd Polish National Catholic Church congregation – Kościół Dobrego Pasterza – moved in, presumably in 1929, based on the cornerstone. It’s not clear when the congregation moved out, but today this modest little church has been converted to a not-so-modest home, which sold for $600K in 2010. No word on what the adjacent rectory house is now used for. 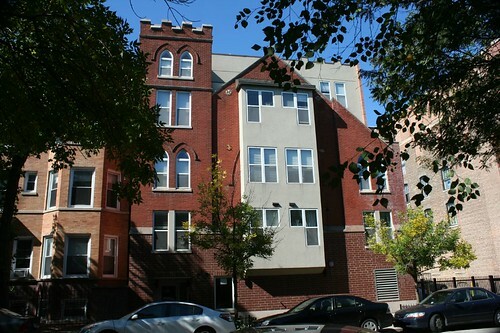 A series of conversions in Lakeview near Belmont best illustrate the common church conversion, in which new floors are constructed within the existing building envelope. The former Elim Swedish Methodist Church, 1021 W. Barry at Kenmore, was built in 1898, with the cornerstone laid in September of that year. Swedish-language services were discontinued in 1942, when the Swedish conferences were merged nationwide with English-only ones. 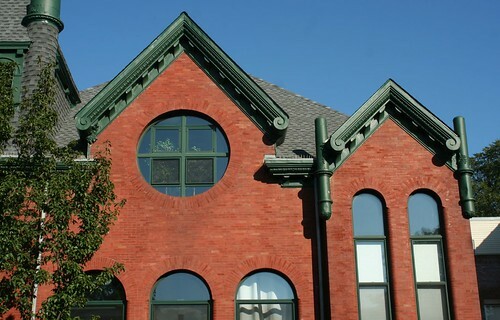 The building was converted to condos in 1983. Upper floor units in this conversion retain some of the rafters and eaves of the original sanctuary. 7 A ground-level garage has been added as well. 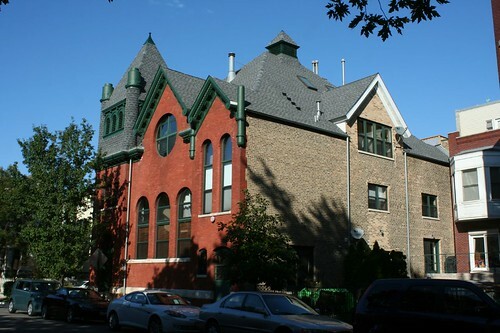 Trinity Swedish Evangelical Lutheran Church – 3101 N. Seminary at Barry – is an 1896 building, constructed to house a congregation founded in 1883. The church’s second pastor, who served from 1901 well into the 1920s, gained some notoriety for his remarkable resemblance to President Hoover. Trinity Swedish Lutheran was followed by the Church of the Valley Assemblies of God – per the sign which remains attached to the building! 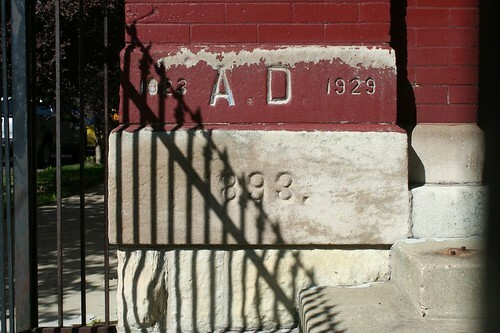 3055/3057 N. Clifton at Barry is a deep mystery – I can find only 1931 and 1937 references to it as Lake View Baptist Church. This entry was posted in historicist churches. Bookmark the permalink. 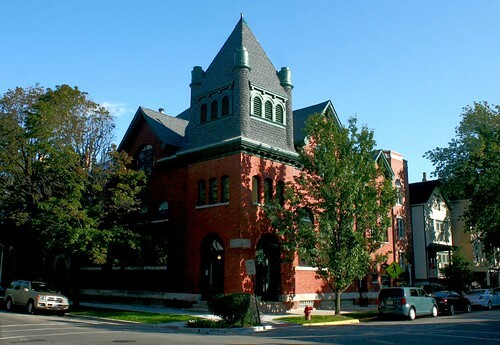 One more for ya, In the late 90’s a church in Beverly on the south side was converted to condos, then in 2005, the christian bookstore on the church campus was converted to a Starbucks. Let’s not forget Buckingham Pews in Lakeview. 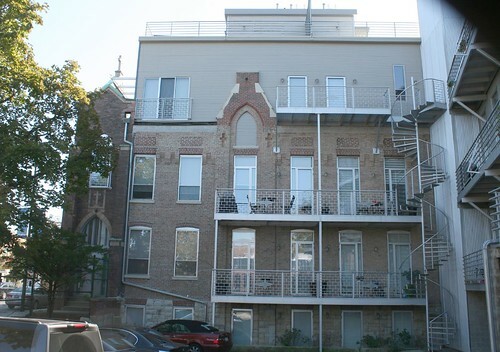 Originally it was home to a synagogue (Emanuel Congregation, now in Edgewater), then converted into a church and now apartments. 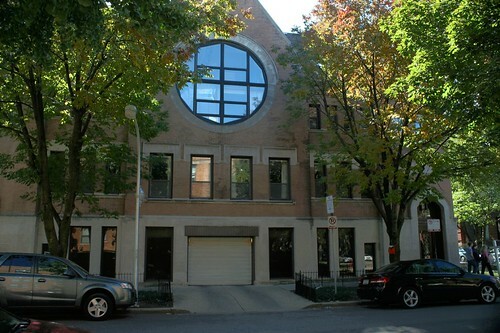 2276 Geneva terrace in Lincoln Park used to be a small church. For a time in the mid-70s it was, I believe, the HQ of Facets Multimedia. I remember seeing the classic silent fim “Napolean” there. It was also used for plays, before it was converted to housing that maintained the old steeple. I do remember seeing a play there based on an HP Lovecraft horror story, where the hero enters an abandoned church that was the site of unholy rites. It just so happened that there was a thunderstorm that night, and the players could not have ordered a better sound effects system! I have been looking for the Lutheran church building in which my paternal grandparents were married in the early 1940s. He was in naval officers’ training just a short distance north of the church at Northwestern and brought the lady who became my grandmother in by train from their home state of South Carolina to marry her and spend their wedding night in what was then the Webster Hotel before being deployed to Japan the next day. On a 2004 business trip to Chicago, I called my grandmother to have her direct me to that church. 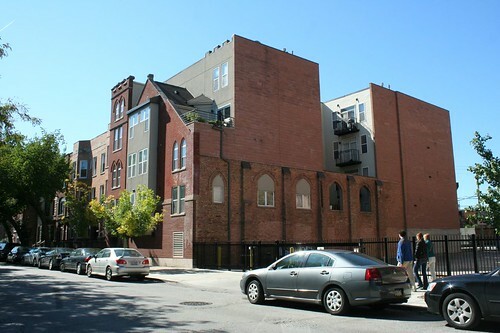 Upon finding it, I discovered that it too had been converted to nice townhomes, sparing the bell tower and all elevations, as well as the cornerstone depicting the church’s two incarnations, one in the late 1800s, and another following a fire in the early 1900s. As you can well imagine, I took copious pictures. My grandmother died just after Mothers Day of 2006, and I have lost track of those pictures. I want to believe that she was referring to notes when she directed me that August day, but I do not know. If there is anyone with knowledge of where these old Lutheran churches are (I know this information is vague toward that conclusive end), I would welcome the help. 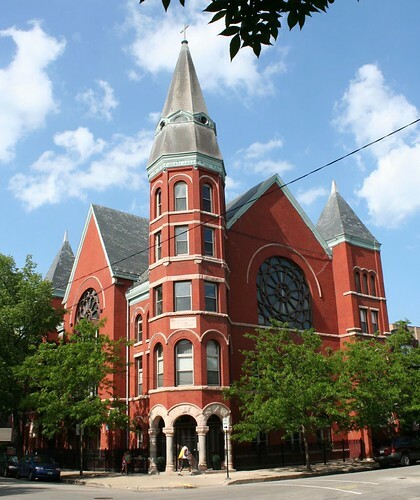 The church on Barry and Clifton was the Pillar of Fire church and school. I went to school there. The lower lever had a chapel, two washrooms and a playroom and storage. The first floor was split with the church entrance to the west and a classroom, offices and an open area to the east. The second floor held two classrooms and to the west was the choir loft and a belfry with storage rooms. The school closed due to low enrollment. It was a Christian church and school. I left in the early 80’s. I went to school there.